We offer TOMBO Brand Equivalent Material with Certifications and Approvals. Vespa Horn Gasket (Rubber) has been produced as per OEM, specifications & Indus Services is supplying these Vespa Horn Gasket (Rubber) to customer in many markets all over the world. Please write us if you have any question about Vespa Horn Gasket (Rubber) . we also make custom types of Vespa Horn Gasket (Rubber) as per customer's requirement & specifications. Contact us for. - Widely used in electrical, automobile, mechanical and many other industries. - Widths: 24", 40", 60"
- Gauge: 1/32", 1/16", 1/8"
We are manufacturer and supplier of Reinforced Gaskets. Made from optimum quality materials, these are widely appreciated for its high tensile strength. Each product is manufactured using high-grade raw material and latest designed. We take pleasure in introducing ourselves as leading firm by offering Wire Mesh Graphite Gasket. 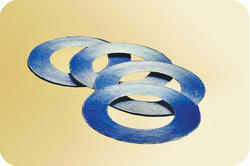 we deals in all types of gaskets like this is a graphite gaskets. 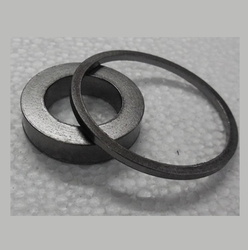 We are a noted exporter and distributor of Graphite Gaskets that are sourced from certified market vendors. Available in different specifications, these products are used for variegated industrial applications. Further, our range is manufactured using high-grade graphite material at the vendors' unit.